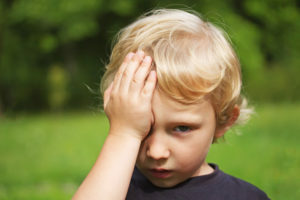 It is perfectly natural for a parent to feel anxious and upset to find out that their child may have a turned eye, or a lazy eye. Many parents also find it confusing because they receive conflicting advice and opinions from well-meaning family and friends. Any concerns about a child having an eye turn, squint or lazy eye should be followed up on immediately. Strabismus – this means an eye turn. The eye can be turning in (esotropia) or out (exotropia). In very rare cases the eye may turn up or down (hypertropia). You may also hear the term squint used by eye surgeons. Up to 5% of people have a strabismus. Amblyopia – this means reduced sight. Also known as lazy eye, and is often associated with strabismus, but may also be present without strabismus. Some people confuse conditions such as convergence insufficiency or droopy eyelids with lazy eye. What can be done to help with eye-turns or lazy eyes? Both of these conditions are treatable to varying degrees. Early detection and treatment is the best course of action, but age might not be considered a barrier to attempting treatment. The nature of the treatment is dependent on age and the type of eye turn or lazy eye. More research is required to understand the success rates of treating adult strabismus and amblyopia, and treatments are currently continuing to be researched. The science is discussed in autobiographical account by neurobiologist Sue Barry in her book “Fixing My Gaze”. The optometrists at Harmony Vision have many years of experience assessing and managing both eye turns and lazy eyes. We used specific testing equipment and techniques for different age groups – babies, toddlers and young children. We recommend assessments at 6 months of age, 3 years old, prep, and then 2-3 years based on need there-after. If you suspect the possibility of an eye-turn, then do not wait for these specific ages, immediate assessment is required.